Recently, I visited Dinanagar, my friend's place. Dinanagar is a small town in Gurdaspur district of Punjab. The place is close to some hilly parts of Himachal Pradesh. This means the recipes of hill dwellers have fused with those of the bordering Punjab districts. So my friend introduced me to a pahari (hill) recipe, which is both sweet & sour. The tangy gravy makes a delightful accompaniment with rice and even roti. I enjoyed it today with rice, roti, and shalgam-aloo bharta. Without much ado, let's go to the recipe. I have altered the recipe a bit. Boil imil in 2 cups of water. Next add besan. 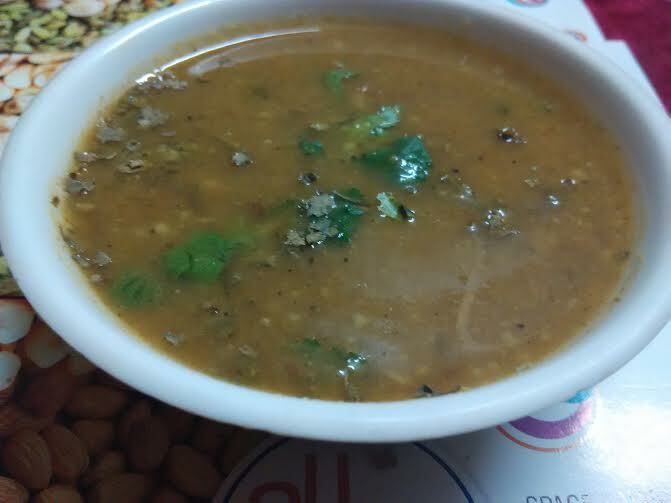 In the authentic version, they do not roast besan, rather, mix it in 1/2 cup of water and then add. Nevertheless even this version tasted good. After besan is roasted. Add little amount of water and mix well so that no lumps are formed. Add salt, turmeric, and sugar. Mix well. Add more water if you want it flowy or soupy. Garnish with kasuri methi or coriander leaves. Even this is not included in the original mani recipe. Enjoy with rice and roti. 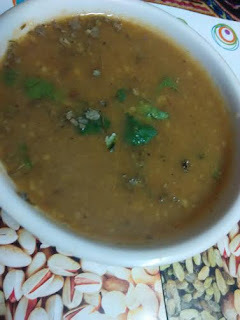 The traditional recipe is dal, mani, and chawal (rice).